Primodent Studio is pleased to offer our one-of-a-kind computer imaging program which can potentially help increase your case acceptance. Research has shown that by utilizing this program, patients are more likely to agree on more extensive restorations if they can actually visualize a new prospective smile, especially when paired with a Diagnostic Wax-Up. By simply taking a digital full face picture of the patient, you can email the photos along with doctor and patient names to Info@PrimodentStudio.com. We will then work on a digital image to send back to you within 1 business day. Your patient can be at ease by being given the opportunity to visualize what their smile will look like after all your hard work. Not only can you stun your patients with a digital preview of how their smile will look, you can also give them something solid and life- like to help your patient make a final decision. 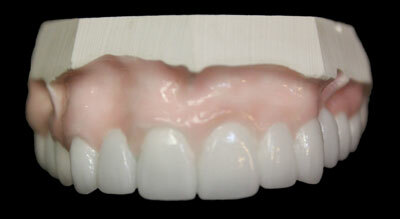 Primodent Studio’s diagnostic wax- ups are intended to replicate the exact details and specifics of your case. Our wax- ups give your patients a realistic model of the appearance of their new smile. 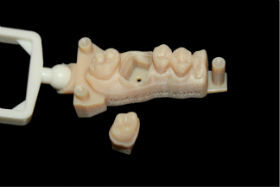 Here at Primodent Studio, we pride ourselves in having multiple options for provisional crowns. Depending on the duration and aesthetic needs for your patient, our temporary crown can be made to satisfy all your patient’s needs. 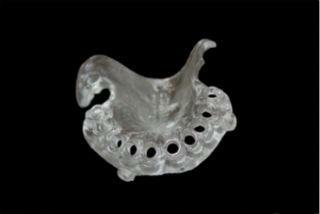 We can fabricate our temporary crowns based on your prepped or pre-op models. Our dental lab is the best option for a temporary restoration that exhibits lifelike esthetics rivaling even natural teeth. Whether prescribed for short-term or long-term use, this restorative option offers an inexpensive interim solution until final restorations are completed. At Primodent, we have worked hard to make proper implant placement become less of a prosthetic dilemma with the use of surgical stents. Surgical Stents provide communication between the surgeon and restoring dentist so that the implant is placed at the ideal prosthetic position and angulation.